This product has been viewed 18218 times. This is Paul Drinkhall's signature blade and designed to his requirements. This blade provides power from both mid distance and close to the table for his aggressive style of play. The blade needed to be very stable to ensure control in the short game. The blade is build with 2 layers of arylate carbon and 5 wood plys. I've been using this blade with tibhar evolution ELS on both sides however I would recommend using a slower rubber such as the evolution FXP or FXS with this blade as it is already fast enough and any faster rubber makes it hard to control unless you are a very high standard player. So the ejing began again, after playing with Force Pro Black Edition for some time, I decided to try Paul Drinkhall's signature blade. It is named the Powerspin Carbon but I named it Paul Drinkhall Spirit, as it is Tibhar's blade designed for Paul who used Timo Spirit previously. Obviously, the PDS is faster than the TMS even I can't believe my eyes that in Dan's review the balls were shooting like rockets. I finally began to realize when I used PDS with Evolution rubbers that even mortals can create ballistics. The first time I hit with the PDS, I can already feel the power of the blade using only short strokes. The blade is really direct that I can shoot the ball anywhere I want. Using brush stroke, the balls produced are really heavy and fast. When using power, the ball blasts off from the blade with incredible speed. A single powerloop can end the point outright because the ball is really low and fast. When the ball is blocked, it is very easy to reloop and continue attacking. Like all composites, minimal effort is needed when blocking and what I like about the PDS is it's ease in countering balls. A loop can be smacked to humiliation. The blocks with PDS is very stable, I can vary my blocking from counter the chop block next with ease. The blade is better if the user has very active strokes. As shown in Dan's review, flicking is made easy with this blade due to it's direct nature. When I first used PSC, I used it with H3 NEO and pushing is very deadly because the ball is loaded with heavy spin and the ball is very low. When I used it with MX-P I had trouble at first but adjusted afterwards. The blade is also very good with the two types of flick, the chiquita (sidespin) and the drive due to it's dwell and a kick of power at the end of the stroke. This blade can compete with Butterfly's ALCs because PDS has more feel than Viscaria and Timo Boll. Comparing it with the Timo Spirit, the Drinkhall Spirit has more dwell, more feel, faster and more powerful. Another plus is that the PDS has minimal artificial feel (ultra carbon vibration) and I really like it as an allwood lover. When I first tried this blade out with an Tibhar Evolution MX-P and a Coppa Speed. I found it too fast for my liking, and made it almost impossible for me too loop with. As the ball just flew off my racket. I found it really hard to use. So when I tried it out with the aforementioned rubbers. I focused on blocking. On blocks, the speed was really good. Control was nice and the it feel unlike other ALC blades that I have used. Speedwise, this blade is around the speed of the DHS Hurricane Long 5, just a tad bit slower. 2nd time I've tried this blade, I used it with Tibhar 5Q+ and Tibhar Evolution FX-S. With the 5Q+ and the FX-S, I finally gotten to appreciate the blade. I could definitely loop with this setup. It was very easy to use. I could vary spin,speed and placement at will and I could generate a lot of spin with this blade. Advanced players would be able to use it with fast rubber like the Tibhar MX-P, just like Paul Drinkhall(it amazes me how he can control such a speed monster)... For intermediate players I'd suggest that it'll be good to pair this with medium or medium soft rubbers. I have been using this blade for a few months now, mainly with MX-P max thickness both sides and at the minute MX-S max on forehand. It is quite a nice designed blade, smooth veneer on head of the blade and quite a thick handle (straight) which is nice I think as usually straight blades are quite thin. Very comfy in the hand and mine weighing 86g felt quite well balanced towards the handle not the head with max thickness rubbers glued on. With the MX-P topspin strokes felt crisp and the throw (or my throw) was producing a nice arc over the net, backhand too. Touch shots were tight with good feeling and a sense you could place them short, low and accurately where you wanted even with the aggressive rubbers on. Stepping off the table a little in the top to top rallies it also felt very safe and that I could place the ball anywhere on the table, with the MX-S this was a little harder to use off the table but I would say that was down to a little less power from the rubber not the blade. Good feedback was felt too giving an extra sense of security. There are other carbon blades like the butterfly alc’s that I think have that little extra power way off the table but you also sacrifice a little control and I would rather be playing mid/at the table any way and don’t mind this minor lack of power. Open ups against backspin using MX-P on Powerspin Carbon were easy if your stroke and footwork were spot on, a little more difficult if out of position or if you couldn’t propel the ball from your legs. I found the MX-S slightly better on this blade for opening up against backspin though, I assume from the extra grip on the rubber. I could play against many backspin balls and felt I could loop drive and win the point. Also if the opponent gave heavy loop in my direction then I could counter loop with great control and ease, if I wanted I could also just smash straight through the spin which I find quite difficult with other carbon blades. Overall I think it’s a really nice carbon blade with good feeling and nice control, enough power for away from the table strokes but I think the rubber you use will help here to. If I were to have any negative comments it would mainly be that unless you struck the ball dead centre sometimes there would be a funny sound, or a vibration from the blade, if you are striking the ball well no problem. Maybe as already said in other reviews the slight flex from the blade caused this vibration, I don’t know but it is a little distracting for me. I would recommend this blade as it is a very good price and if you are looking to change from an all wood blade then the control this carbon blade gives will help with that transition too. It has good spin, quite a nice sweet spot and I personally (even with aggressive rubbers) think it has loads of control. Rubbers used on the blade: Butterfly Tenergy 05-FX on both sides. I have been using this conbination for over a couple of months now. The review is based on my thoughts on the blade after I got used to how the blade works. I have it in flared handle and felt comfortable in hand. It felt like the most comfortable and light blade I have ever used; I tried (DHS A4002 blade, Donic Team 900 blade, Donic Schildkrot Carbotec 50, Andro Super Core Cell ALL, Joo Se Hyuk, Xiom Allround S, Stiga Carbonado 145 and Stiga Emerald VPS) in the past. General Topspin Strokes: Due to an extended dwell time and throw angle, I first struggled to work out the angle and how much I should brush to make quality shots. After a while, I managed to get the touch of the blade and I found the ALC giving me a stable feel on the strokes. The higher throw angle certainly helped me to hit at a closed angle(10~20degrees above the horizontal to be precise :D) with confidence promising the safety over the net. I like the way every shot felt nice and stable due to the carbon layer. However, I noticed a slight flex which caused some vibration(it's how I felt personally so others may think differently). Moreover, what I really liked about this blade is, the topspin against backspin was made easier despite tenergy 05fx being said to be a spin sensitive rubber. The extended dwell time gave me an increased control and did help me generate more spin with ease but personally, I would not say it is as intense as its name, 'Powerspin'. Especially with backhand topspin I whip(or give catapult effect) more than I normally do with my wrist to ensure a smooth solid brush stroke since the blade is a bit flex. Spin In General(in match situations and when serving): Generating spin is indeed made easier as I can sense the feeling that I get when rubber generates a quality spin with minimal effort. When I serve, I normally prefer some weight on the head of the bat to have my wrist as a pivot to quicker the brushing motion as I whip my 'loosen' wrist fast. Most importantly, in match situations, considering the amount of pressure, it's not always easy to be meticulous with generating spin. However, I found this blade to be quite effective with allowing promising amount of spin in such situations as well. It would have been perfect for me if the head was little bit heavier and stiffer. Overall: I tried this blade with Tibhar Euro Soft Grip S rubber on both sides before and it looks like Tenergy 05 or 05FX would go better with this blade. The blade could be a little more stiffer and a tiny bit heavier on the head to get a soild feel on the hits. I have tried carbonado 145 before and I would say this one certainly provides better feel and greater control. I would say it is suited for intermediate players that are spin orientated. Furthermore, some quality chopping can be done from close to the table to mid distance so could be suitable for some choppers as well but not recommended for those who chop far from the table since it has a bit of flex and is not stiff enough. Hi everyone, in the review video below I am with Paul Drinkhall the 2016 World Team Bronze Medallist, and we are looking at his personal blade with Tibhar, the Drinkhall Powerspin Carbon. 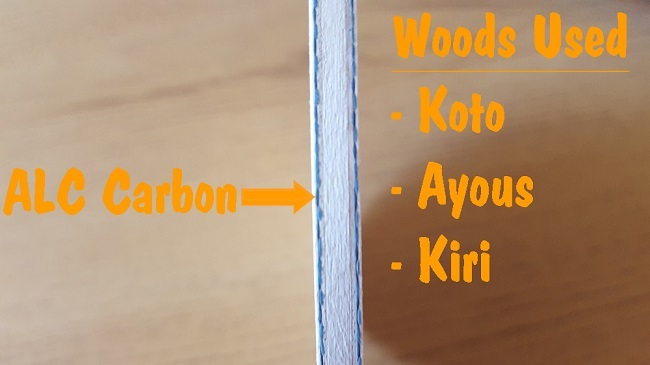 This blade is comprised of 7 plys and made up of 5 layers of wood and 2 layers of arylate carbon with a simple and clean design. Paul worked with Tibhar to develop him a blade that gives him outstanding control with high end speed and good shock absorption on impact. The blades handle and surface feel very smooth, and is very comfortable to hold. 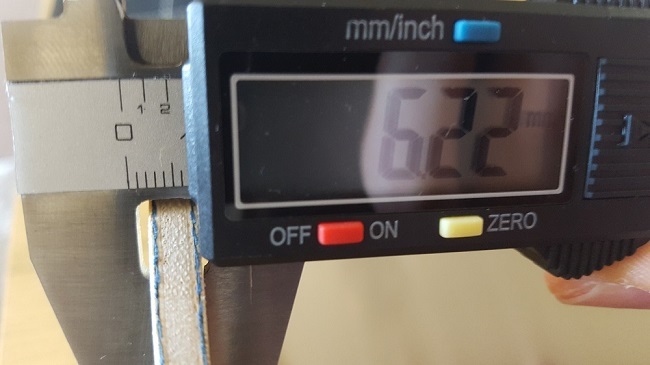 The blade weighs 86 grams which is reasonably light and has a thickness of 6.2mm. Myself and Paul use the Tibhar Evolution MX-P rubbers on both sides of the blades. At the beginning I noticed the power I could generate with this blade the ball literally rocketed off the bat. I could topspin with a lot of speed whilst maintaining the control due to the direct arc. The blades crisp sound and carbon feel is very evident. Similar to the Drinkhall all round blade review i had difficulty controlling Paul’s extreme topspin shots due to the intense speed and spin. It is so impressive how Paul gets so much quality on the ball with such small, compact strokes. 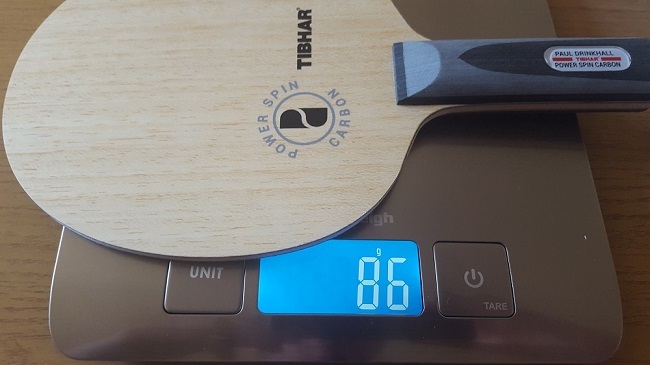 Paul had tried many samples in the build up to making this blade and he said this final version had the best balance between speed and spin for the advanced player. During 3 point forehands I liked how I felt confident going for power on low balls. Even when Paul dropped back from the table I felt I was able to keep the pressure on him without using too much effort. Combining the blades with the Evolution MX-P rubbers gave us both a large amount of spin. The Powerspin Carbon has sufficient dwell when playing against backspin to produce a lot of spin on the ball. I also liked the arc I could produce when I slowed the game down and went for maximum rotation on the ball. We both had good feeling when touching short over the table, again one of Paul’s strength is his short game with flicks and close range attacks and found no problem hitting directly through the ball with pace. Counter topspin worked well due to the direct nature of the blade playing close range shots. Playing against Paul’s forehand topspin from away from the table was not easy however when I timed the ball well and connected accurately I could produce a great topspin. The Drinkhall Power Spin blade has definitely been designed for fast attacking close range play. The blade is very suitable for players who like to play aggressive on flicks and 3 ball attacks, something which Paul is renowned for. Paul really is a world class player and, when playing with him, it amazed me how much precision and timing he had in all of his shots. Although this blade is great at aggressive shots, he noted how he felt he could hold attacks well when passive blocking. This well balanced blade we would recommend it for players who are proficient in technique and have a fast stable attacking game. This blade is definitely a top of the range blade from Tibhar, stacking up well with other premium carbon blades.